A Chinese take away can be found on practically any high street across the UK, and Chinese is a popular choice for a Friday night in. It’s probably not the type of food that we eat every day, but just what’s in your average western style Chinese meal, and how can you try and get the best from your Chinese? What’s Good About Chinese Fast Food? 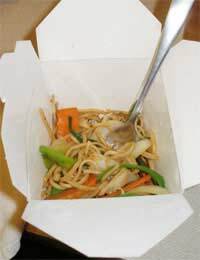 On average, Chinese food contains less saturated fat than many of the other popular takeaway choices. Many of the ingredients in a Chinese dish are vegetable based, so it’s possible to have a reasonably filling main dish and rice, and still keep the fat and calorie content of your meal lower than, for example, a Chicken Tikka Masala. The vegetables in Chinese food are usually lightly steamed or stir fried, which is good because it keeps the nutrients in the food.Some other good options on the Chinese takeaway menu are soups – hot and sour, chicken and sweet corn, or mushroom. These clear soups are usually low in calories and often contain some vegetables to bulk the dish out. Opt for plain, steamed rice and you’ll also be able to claim that you’ve had a healthy Chinese meal. Make it brown rice and you can practically see that halo shining from here! The trouble is that a great many of the dishes on the Chinese menu are not steamed at all, but fried, which will substantially increase fat and calorie levels. Some ingredients are deep fried, such as sweet and sour balls, which when combined with a calorie laden sweet and sour Chinese sauce, can take the calorie content of a typical dish to somewhere in the region of 1000 for an average dish. That’s half the average woman’s daily intake! Opt for fried rice of any description with your sweet and sour and you’re soaking all that healthy, nutritious rice with a huge dose of nothing but oil. It might be stir fried, but because the grains are so tiny, each one soaks up a hefty amount of the oil which will do absolutely nothing to help your health. A portion of egg fried rice contains over 600 calories...all for a bit of egg and a different cooking method. Add chicken, pork and various other meats to the ingredients and you add saturated fat to the mix too. Crispy duck is another Chinese fast food takeaway favourite but beware - just two filled pancakes contains around 400 calories, and as it’s usually just another starter and not a main course, you could end up taking in a lot of extra calories. Most of the fat content comes from the skin that’s served with the duck, and so you could try and avoid the skin where possible. Then cram the rest of the pancake with cucumber and spring onion, add a spoonful of plum sauce and you should be able to reduce the calories and up the nutritional value. Monosodium Glutamate, or MSG, is a flavour enhancer used extensively in Chinese food. It’s usually made from fermented sugar beet or sugar cane molasses, and some experts blame it for what’s called "Chinese Restaurant Syndrome" – said to cause headaches, dizziness, and even chest pains in some people after eating Chinese fast food. Most people aren’t adversely affected, but asthmatics and people prone to food intolerance should be aware.